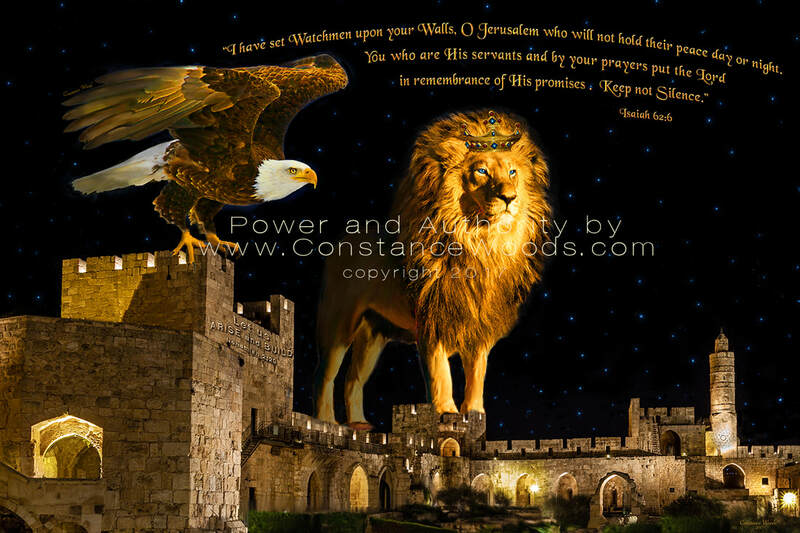 Artwork and prophetic word from Yeshua through Constance Woods. The eagle ~ Her “strength and commanding presence,” her “stealthy gaze,” and her “readiness of flight” reveal the powerful high calling on her life. The lion exudes a countenance of highest authority in the kingdom. He is majestic, he is fierce yet compassionate and unmovable, unshakable, and unstoppable. When he roars, his voice is recognized, his voice is heard. The size and placement of the subjects is deliberate, because it captures that their eyes are on the exact same latitude. This is a message about two generals that are assigned to a life and calling of Strategic Level Warfare. This is to convey the two are in complete unity, each with specific assignments. The eagle at times “will be invisible” to ground level activities as she will be flying and soaring when instructed by Holy Spirit. Being the unseen one carries its unique set of challenges. It requires great humility, wisdom and the fear of the Lord (Isaiah 11). She is clothed in these by the Lord. She has contended much for this “garment” during her journey with God. She has been intentional in her pursuit of God and has willingly paid the price for this anointing, “this mantle,” that she carries. The lion and the eagle, the priest and the king, the apostle and the prophet, righteousness and justice, all of these relate to the dynamic of your calling as a unified couple. Beloved, Shalom, and greetings in the name of our Bridegroom King, Yeshua HaMasiach. I could go on and on with writing my insights and prophetic revelation on this image. But, I am hearing God say that less is more in this matter. The art speaks more clearly than my words. I am certain you will receive all that Adonai has for you in and through this artwork. Please remember that this image was inspired by Holy Spirit’s creative design specifically for you, and it is for His Kingdom Purposes. It has truly been a privilege to be a part of this assignment. I give all the glory to Adonai Elohim, the One Who Is Worthy of all honor, the One whose love captivates our hearts.